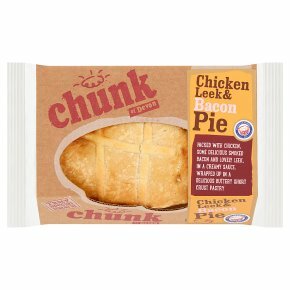 British Pie Awards - Gold 2017. Tasty special natural. Packed with chicken, some delicious smoked bacon and lovely leek, in a creamy sauce. Wrapped up in a delicious buttery short crust pastry Proud winners of stacks of awards for our Pies, Pasties and Sausage Rolls. Handmade in Devon by the Hunks from Chunk! Our 'Rustic Gourmet' recipes have bold flavours, naturally packed with British high welfare meats and best locally sourced ingredients, wrapped in our tasty pastry. Go on - take a chunk! Enjoy me cold if you simply can't wait! - or - to heat me: Remove all packaging place on a baking tray into a preheated oven. 180ºC, 160ºC fan, 350ºF, Gas Mark 4.For approximately 25 minutes. (Best not to microwave as this will make the pastry soggy).